Head-rests with brown-and-white sgraffito designs of this type are known to have been made by the Ding kilns of Hebei, but are much coarser in material and workmanship than the monochrome white wares from the same kilns, such as, for example, [LI1301.234] in the Barlow Collection. The animal is naturalistically modelled, reclining, with a square blanket spread over its back. Its powerful head is turned to the left, the front paws are crossed, the tail resting on its left hind paw, which is just visible underneath the massive body. The head is fiercely rendered, with bulging eyes painted in brown pigment, prominent bushy eyebrows and whiskers raised in relief, rounded nose with pierced nostrils, the mouth slightly opened with fangs protruding, the chin with a beard formed of two tufts of hair, the small cupped ears bent forward, the long mane combed back in softly curving lines. 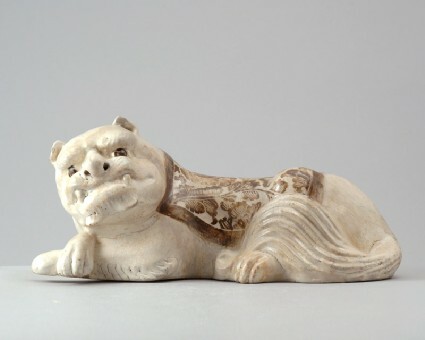 The front legs have bushy strips of hair, indicated by deeply incised diagonal strokes, with further hair indicated overall by fine incising, the tail combed in thick strands. The figure is coated with a white slip, the blanket painted in brown with a plain border and a dense scrolling peony design with details carved through to the white slip in sgraffito manner, all covered by a crackled transparent glaze. The flat underside was left in the grey biscuit, the figure is hollow, with a ball of clay rattling inside.